Little Miss Rosie went to her forever (beach) home! She has a cozy new bed with ocean views, and a loving family. We are so excited to announce that Rogue (formerly Ellie) has been adopted! Rogue now loves to walk at Riverfront Park with her mom, play with her all her toys, and hang out with her new dog friends! Congratulations Rogue, you definitely hit the jackpot!! Poppy (formerly known as Mia) is officially with her new family. Poppy was originally given away with her puppies on a social media page. Fortunately, our super foster mom (Sara) immediately picked up mama and babies once notified of rescue being needed. Poppy is now able to finally be a dog and no longer has to worry about being in a safe environment. She is surrounded by a family full of humans and she certainly deserves it. Congratulations, Poppy! Welcome to your new life! Our sweet, timid Kirby has finally landed an awesome forever home. Kirby came to us extremely scared and nervous. He didn’t trust people and would generally hide when humans would like to greet him. Kirby’s forever parents are extremely patient with him. They are adjusting their lives to meet his needs. Kirby also has a canine sister who he loves. The two play with one another and then relax on the sofa. After a lot of meet and greets, Kirby is officially at home. We are so excited for this guy. Congratulations, Kirby! Barney with his FOREVER dad! Y’all probably don’t recognize this guy now that he is completely healthy now. Barney came to us incredibly scared, he had no fur, and a huge testicular tumor. Now this guy is living the life! He enjoys spending time playing in his yard and relaxing in his sun room. We suspect that this guy was used for hunting and then dumped when no longer needed, but not any more! Congratulations on your new life, Barney! We love you! ADOPTION ANNOUNCEMENT!!! A few months ago, our sweet Henry was found with a feral pack hiding in the woods. He came to us a very sick, and very scared puppy, but his foster parents nursed him up quickly! We took him to an adoption event in Columbia, and Dana quickly fell in love. We are SO HAPPY that his new mom looked past his timidness and helped him adjust to his new life. Henry now enjoys playing with his fur brother Dozer and snuggling with his parents. Congratulations Henry, we know you are in the absolute best home possible!!! Adoption Announcement!!!!! Sweet Eloise and her sister were pulled from a high kill shelter in Columbia a couple of months ago. After having a chaotic weekend of foster blunders, Elaine saved the day and offered to foster Eloise. Here we are now and Elaine has decided Eloise is just too cute to let go! Eloise has a fur brother as well as some feline siblings, and is loved so much by her human parents! She gets to spend her days playing with her siblings, and spend her nights cuddled up in her mom’s bed. We couldn’t be happier for this girl, CONGRATULATIONS ELOISE!!! 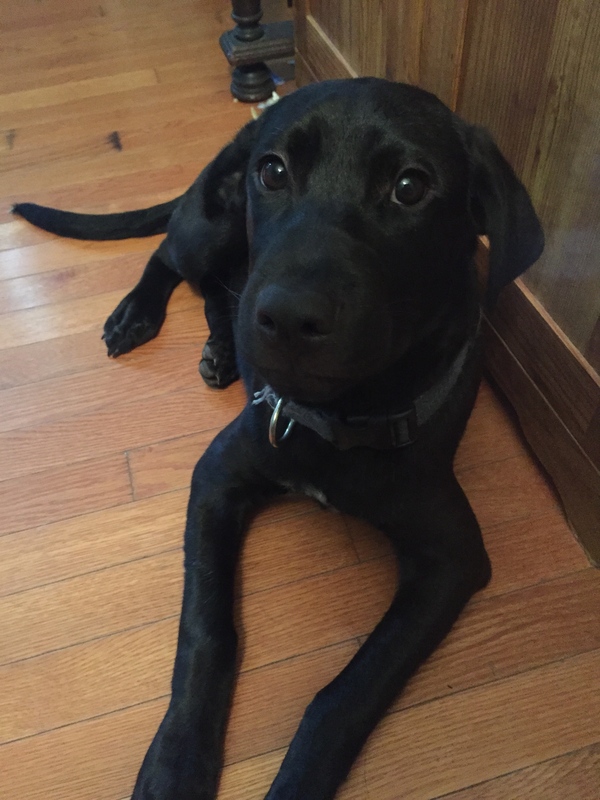 BLACK DOG ADOPTION ANNOUNCEMENT! Dyson has found his forever home. Dyson originally came to us from Horry County. He was an owner surrender to the shelter, meaning he could have been euthanized immediately. Fortunately, the right people stepped up at the right time and we were able to pull Dyson to safety. Dyson now has a family full of people who love him. His family stays home with him most of the day so his anxiety is kept to a minimum now and he no longer has to worry about ever being abandoned. Congratulations, Dyson! You did it! We are so excited to announce that our Girlie Girl (now known as Carly) has found her FOREVER HOME and we couldn’t be any more happy! Carly has a fur brother named Cairo, and as you can tell, they are doing just fine with one another! They even look like they could’ve come from the same litter – so adorable! Carly has 2 adult humans and a kid human who have promised to love her forever. Carly is living the life where she can play as much as she wants and then nap hard afterwards! Congratulations, Carly! You’ve been waiting for quite some time to find the right family and you deserve this happily ever after! Iggy’s puppies are officially going off to their forever homes! A big congratulations to Mac for living the fab life in his new forever home. It looks like he fits right in! So much love in one picture! So happy to announce some awesome news! JACK AND PIE ARE OFFICIALLY ADOPTED. These 2 guys were originally pulled from York County. They were adopted from us previously and then returned. However, this is definitely their happily ever after! Jack (now known as Jax) and Pie have an amazing new mom and dad – but the best part is their new forever human kid sibling! As you can see, they have such a close bond already. A big THANK YOU to everyone who played a part in the journey for Jack and Pie. Congratulations, boys! You’re home! Remember when a shelter worker sent a plea for a little black pit mix who was on death row? Well, once we asked the community to help out – y’all definitely did. An angel name Brittany went and pulled the pup and took him home to foster. Not even a day later, Brittany knew this little black pit mix (now named Jackson) wasn’t going any where. That’s right, Jackson is in his FOREVER HOME. He has a fur sibling and a lot of humans who love him very much. As you can see, he is quite comfy in his new home. Thank you Brittany for saving this babe! Congratulations, Jackson!! You deserve this! Please remember that there are SO many other perfectly wonderful animals on death row. Even though these animals are perfectly healthy with great temperaments, they’ll still be euthanized. We can only help these sweet babes if YOU help us. Please consider adopting, fostering, and/or donating today! This is Percy’s “told ya” face. As in, “I TOLD YA I WASN’T GOING ANYWHERE, MOM!” That’s right, Percy is officially ADOPTED! His foster mom has turned into a foster fail yet again. Percy enjoys playing with his 6 fur sisters in their huge fenced in back yard. Although Percy has a human dad, he is a complete Mama’s boy and would be lost without her. Lucky for him, she’s not going anywhere! Congratulations, Percy! Bella #4 is officially adopted and she’s definitely hit the jackpot! Bella’s mom traveled all the way from the Upstate to Charleston to make Bella her own. 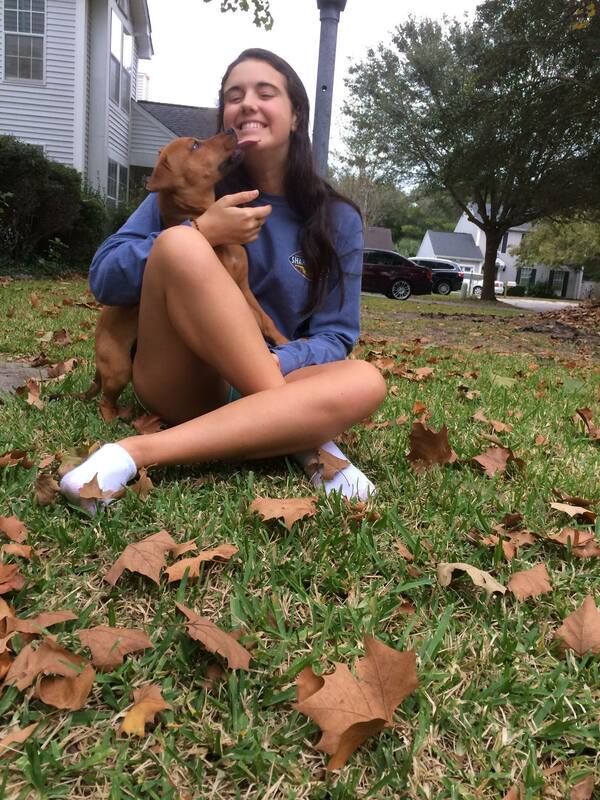 Her forever mom says that she’s “absolutely perfect.” Bella also has a human niece named…BELLA! As you can see, Bella and Bella are getting along just fine. Congratulations on your happily ever after, Bella #4! Remember the husky that was dumped on the side of the road? Well, he went into a foster home and that foster home has decided to keep him forever and ever! Diesel, now known as “Willy” is a perfect gentleman in his new home. He’s fantastic with the human kids and acts like this was his home all along. Wily has an eye appointment on the 30th. Once we figure out his diagnosis, we will then focus on his heartworm treatment. Congratulations, Willy! You now have the home that you deserve! Zeus is officially in his forever home! The previous owner of Zeus took their own life and the family wasn’t able to take care of him – so off to the shelter he went and to Eunoia Rescue he arrived. It took Zeus a while to come out of his shell, but thanks to Charleston Dog Wizard, he learned manners and how to be a dog. Now, Zeus is such a happy boy and we are so happy for him! I (Alicia) am a spiritual person and I like to think that Zeus’ previous owner is looking down on us with a smile. Congratulations, Zeus!! You deserve this!! Our last kitten from Lee County has been adopted! Chirp (formerly known as Gaston) has officially been adopted by one of our valued volunteers! As you can see, Chirp has become bff with his new canine sister. The adopting family had recently said goodbye to their previous cat who passed, and they say that Chirp has brought them a ton of joy and has seriously helped them with the grieving process of missing their old feline friend. Chirp, thanks for being you and congrats on your new home! This adoption announcement is WAY past due – but our sweet Abbie has found her forever home! Her personality has blossomed and she enjoys being loved by her humans. She also has a fur brother that she plays with in her very own backyard. Congratulations, Abbie! Oreo (the small, blackish pup laying on the bed) has officially found her forever home! She has definitely hit the jackpot and now resides with a house full of those her love her. What’s even better is that her fur brother, Yoda (aka Spencer), was also adopted from Eunoia Rescue! Happy tails all around! Congratulations, Oreo! Our sweet, sweet Pancake has been adopted! His forever parents are neighbors with his foster parents, so he will always have the best of both worlds. As you can see, Pancake is loving his new forever fur sister! These two have a routine of playing and cuddling. Congratulations, Pancake! One of our precious kittens being fostered by EarthWise Pet in Mount Pleasant has officially been adopted…and it looks like she has hit the jackpot! We are so happy that this precious kitty has made it to her forever home! OH HAPPY DAY!! Our two senior doxies are officially in their forever home! Princess and Leia (now named Lily) are with each other and they have another doxie sister named Petunia. Their new mom is the best and it took these 2 pups no time to adjust to their new life. Congrats, Princess and Leia! We are VERY excited to announce that after many “meet and greets” Cooper has FINALLY found his FOREVER HOME. He and his fur brother, Finn, have quickly become the best of friends. His new mom is also a vet – so he will always be in the best care! Cooper was with us for a while, but he definitely hit the jackpot. YAY, Cooper! Paul (one of our kittens pulled from Saint Frances Animal Shelter) was adopted on June 22! Paul was immediately showered with gifts once he arrived to his forever home. Another kicker? Paul the kitten was adopted by a man named…PAUL! HP&KP4L (Human Paul and Kitten Paul for Life). Congratulations, Paul! Here is a picture of Oliver comfortably waking up in his FOREVER HOME! That’s right, Oliver is officially adopted! He went home to be “fostered for Memorial Day Weekend” and will now be staying there forever. Oliver has 3 fur siblings, 3 human siblings, and 2 human parents who are going to love him forever and ever. Oliver has been with Eunoia for a while and we are thrilled that he has found his happily ever after. Way to go, Oliver! China has officially been adopted! She was in a foster home and they decided that they just couldn’t give her up. Her new mom says that China fits in perfectly and it seems like she’s been their dog forever. China has a fur sibling named Sherlock and as you can see, they enjoy a good ol’ snooze on the same pillow after playing. Congratulations, China! We are happy you found your happily ever after! Clementine is OFFICIALLY adopted!! Yay! Clementine first came to us from death row in York County, South Carolina. She was heartworm positive and hesitant about almost everything. She went to a foster home…and they’ve decided to keep her! They have really been working with Clementine over the past few months to make sure she was able to build confidence in their environment…and she was! (We guess you could say that Clementine chose them.) Clementine now loves rolling in the grass, lounging with her canine sibling, and hunting for lizards. Way to go, Clementine! Mo has officially been adopted! He is now with a Mama who loves all of him for who he is. So far in his new home, Mo has already jumped in the community pond while chasing ducks. He’s absolutely in love with his teenage human sister. Mo is also enjoying car rides, destroying stuffed toys, and keeping out of his canine siblings way (they’re a bit on the older side). Right now, Mo is learning how to play fetch and his new mom says that he’s, “pretty good at bringing it back.” Wow! What an awesome story for Mr. Mo! Thank you to his new family for saving him when almost everyone else had given up! Bella #3 (now known as Pepper) is feeling rather comfy in her new FOREVER home. She has 2 feline siblings and 2 human parents who give her a lot of love. When we first got this pup, she was very timid and didn’t trust humans. She has really come out of her shell and has turned into quite the cuddle bug. This girl deserves her happily ever after. Yay! Willow’s foster mom just couldn’t let her go…so she is officially in her forever home! Willow has a human roomie that loves her just as much AND a big canine sister to hang out with. Willow has been enjoying going to the park and then coming home and taking a nap on the sofa with her mom. We are so happy for you, Willow! Saved from a parking lot – and now someone’s best friend. Yay! We are so happy that we can finally share the news about Max! We pulled Max out of Lee County a few months ago. While Max was with us, a wonderful group called Pets for Vets contacted us asking if we had any eligible dogs. Naturally, we suggested Max because he’s so sweet and easy going. After passing the temperament test and training – Max is now in his forever home with his veteran as a comfort dog! So crazy to think that this guy went from being in a shelter to having such a special job! Way to go, Max! A huge THANK YOU goes to Max’s veteran and to all others serving or who have served in the military. Another thank you goes to Pets for Vets- Charleston, SC for this awesome opportunity! We hope to work with y’all again soon in the future! Our old man Roger is officially adopted! We are so excited for this guy. Roger was originally an surrendered to a shelter in Lexington, South Carolina. He had a hairless tail and was extremely confused about what was going on. Now, he’s living the life! He has a dog sibling, a cat sibling, and a human mom that works from home. Needless to say, Roger is getting a lot of love! Congratulations, Roger! Spencer has found his forever home! This guy has certainly received his happily ever after. He now has a big house with an awesome back yard to play in. He also has 4 humans to call his very own. Spencer has particularly bonded with his 4 year old sister. They like to watch tv, color, and play dress up together. Congratulations, Spencer! You deserve it! Another adoption announcement for today! Elianna is in her forever home. Do you think she’s comfy there? Elianna has a big family full of kids that adore her. They take her to the park and play tug o’ war with her favorite rope toy. Elianna is living the life! Lots of love to you, precious pup! FINALLY!! Our sweet Shelby is adopted! Shelby has been with Eunoia Rescue for 5-6 months…but she has now found her person. Shelby spends a lot of her time with other fur friends – but at the end of the day – it’s just her and her daddy! We are SO happy for you, Shelby! CHARLIE IS ADOPTED! Sweet Charlie moved to his forever home in North Carolina last Saturday. He is getting a lot of attention from his new people. His parents say that they will, “love him like a child.” Congratulations, Charlie! We love you and know that you’re in the most perfect place! Luna’s foster mom just couldn’t give her up so she’s keeping her forever! When we first pulled Luna she was a pretty scared pup – she was even afraid of walking on a leash. Now – Luna loves everyone, doesn’t mind leash walks, and enjoys playing. We are so happy for this special pup! Buddha has been adopted! He and his forever dad have quickly become the best of friends. Buddha’s dad says that the bond was almost instant; he even noted that he “couldn’t believe this dog was actually on the euthanasia list.” Fortunately, Buddha now has a loving home where he’s allowed to snuggle in the bed. Way to go, Buddha! This baby was with Eunoia Rescue for about 2 seconds before being adopted! He now has an extremely happy forever home with the best human parents ever. He’s even enrolled in training classes starting tomorrow! Dexter, now known as Moo Moo, brings so much happiness to his home. His parents say that they couldn’t imagine life without him. Congratulations, Moo Moo! Sweet Pea (now known as Sully) has officially been adopted! She now has a forever dad that loves her oh so much. She also has a human roomie and a fur roomie that help take care of her as well. Yay, Sully! A huge thank you to K9 Good Manners for taking this pup in. She was originally dumped on the side of the road before K9 Good Manners took her in and cleaned her up. This pup has definitely found her happily ever after! We have a VERY special adoption announcement! Mama Lily is officially adopted! Lily came to us from York County. Two days later, she had puppies! We had no idea she was even expecting! Her two babies have been placed in wonderful homes and now it’s Mama’s turn. Lily has a human mom and dad. As you can see, she’s the center of their world. The most exciting part of this is that Lily’s owners drove down all the way from VIRGINIA to adopt her! We are so happy for you, Lily. A HUGE THANK YOU goes to Carrie of Riley’s Place Pet Retreat! Carrie fostered Lily and helped build her confidence tremendously. Before, Lily wasn’t trusting of people…but now…she just wants love! Yay! Jack and Beau (once known as Pie) are off to their forever homes!! This bonded pair have been with us for quite some time and they have found their match. They are going to live a fantastic life in Columbia where they have a big fenced in back yard to chase squirrels. A huge THANK YOU to Gaby and Bruce for fostering these two for so long and building their confidence. Another thanks to Ann and Skip for adopting these two together. Of course, another thank you to York County for allowing us to pull these two babes. We are so excited to say that these guys are going to live happily ever after! Floyd (now known as Abel) is officially in his forever home and he has an absolutely wonderful family. The family says that Abel is one of the sweetest pups that they’ve ever met, easy-going, and intelligent. Abel’s two human siblings have grown extremely attached to him, especially the youngest. Abel’s new mama says that her 1.5 year old was born prematurely and has been a little behind in speech. The day that Abel arrived, she started saying “dog” and then a week after that she started saying “mama.” (Yes, the baby learned how to say the word “dog” before she said “mama.”) Abel has been incredibly patient with the children and the family says that it’s an absolute joy to have him in their home. This is such a beautiful story for such an amazing pup!! Way to go, Abel! A special shout out goes to Valiant: Animal Rescue + Relief for saving this baby during the time of Hurricane Matthew! Matthew, now known as Murphy, is officially in his forever home! Lucky for this guy, his foster family decided to keep him! He has a big human family and two fur siblings. Congratulations, Murphy! You certainly deserve a happily ever after! A shoutout goes to Valiant Animal Rescue + Relief for originally saving this boy and his two siblings! Cody has been adopted! He’s definitely feeling like he’s right at home! Cody now has a fur sibling and a couple of human siblings as well. The whole family loves him, and clearly, he loves the whole family. Way to go, Cody! Alvin has officially been re-homed! Alvin was our first dog that Eunoia Rescue adopted out. Unfortunately, the adopting family came across some challenging circumstances and felt it was best that they allowed Alvin to move to a new place where these circumstances didn’t interfere with his life. Luckily for Alvin – a friend of the family decided to adopt him! Yay! As you can see, Alvin is delighted in his new home. A huge thank you goes to Jeff Triphahn of Trips Home Inspections, LLC for sponsoring Alvin’s ad in the Charleston City Paper! Katrina, now known as Luna, has officially been adopted! She has 2 humans to call her very own! Luna has already learned a few new tricks and her parents are impressed with how smart she is. Luna is also receiving a lot of snuggles in her new home – so it’s definitely a perfect match! We are so happy this girl found a “furever” home! A shoutout goes to Valiant: Animal Rescue + Relief for originally saving this babe and her 2 brothers! Bubbles, now named Sophie, has officially been adopted! Sophie was spotted at the Eat, Drink, Rescue event by her new forever mama. It was definitely love at first sight. Her mom says that Sophie is, “a great little puppy.” Congratulations, Sophie! ***ADOPTION ANNOUNCEMENT*** Our baby that just went through heartworm treatment – Lady now known as Marge – has been adopted! She went to the most perfect home and her new mom says that it was “love at first sight.” Marge has a comfy house and a backyard to claim for her very own. Yay, Marge! We have a very, very special adoption announcement!! Pierre, who has been with us since last April – is officially ADOPTED!! He has found the most wonderful family to spend the rest of his life with. Thank you so much to everyone who made this adoption possible, especially K9 Good Manners who donated their boarding and training services for the past 4 months. A huge thank you also goes to:Dog Daze, Lowcountry Dog Magazine, The Weinman Family, Riley’s Place Pet Retreat, and Lowcountry Live WCIV. Pierre is so, so happy in his forever home and he certainly deserves this happiness! Congratulations, Pierre! Smokey was enrolled in our rescue for literally 10 minutes before being adopted! He now has 2 human parents and as you can see, he’s certainly enjoying his new life! Smokey was adopted at the 2nd Annual Eat, Drink, Rescue event sponsored by Lowcountry Dog Magazine at Smoky Oak Taproom We are so happy that Smokey was able to find his people! Happy adoption day to one of Lily’s puppies – Princess Leia! She’s already so loved and completely spoiled in her new home. A huge thanks to Carrie with Riley’s Place Pet Retreat for being such a great foster mommy to Lily and her puppies! Have a happily forever after, Princess Leia! Petie (shelter name Ralphie) has officially been adopted! As you can see, Petie loves his owner very much! Petie’s new owner says, “I may have been the one who gave him a home and a warm bed – but he’s the one who saved me.” So many happy feelings!! Hardy (now know as Monty) has been adopted to a fantastic couple who completely spoil him. They love him very much and have been extremely patient as he adjusts to his new life. We are so happy to see that this boy has the forever home he deserves! Our anxious Maddox has been adopted into the most perfect family! He has other fur siblings and a human with him at all times. We visited Maddox yesterday, and he’s as happy as can be! Congratulations, Maddox! Our Smiley from the Colleton County shelter has been adopted! Smiley now has 2 human parents and a fur sibling that doesn’t mind giving her a warm place to rest her head. Smiley’s new parents say that she is “perfect.” A huge shout out to Smiley’s foster, Holly – who was able to build Smiley’s confidence once she was out of the shelter. We are so happy this girl has found her forever home. Finally – our precious Lucy is officially adopted! Lucy was originally pulled from Williamsburg County. She was adopted out from us about a year ago and then returned a few months later. After waiting for what seemed like forever, Lucy’s new mom came to the rescue. Lucy’s mom says that she is 100% committed to her and that she couldn’t imagine her life without her. Looking at this picture, I would say that Lucy is pretty happy too! Cornell (rescue name, Buster) is officially in his forever home! (As you can tell, he’s already made himself comfy in his new bed!) Cornell now has a human mommy and a fur sister. He is so very happy. Thanks to everyone who was able to make Cornell’s Christmas wish come true! Our final little kitten, Olly, has found her forever home. She is loving all of the attention she’s getting from her new mom. Olly never knew she could be so lucky! Way to go, Olly! Our precious Ozzy kitten has been adopted! Her new family adores her and we couldn’t be happier! Yay, Ozzy!! Our precious Odell kitty has officially been adopted! He is living a very happy life with another feline friend and a lot of humans who give him a lot of love. Congratulations, Odell! It seemed as though Wally was NEVER going to get adopted! However, a supporter of Eunoia Rescue decided to give Wally a chance and it’s working out great! This is Wally in a tractor working on his new farm. This adoption was bitter-sweet for us, but we are so happy that Wally is finally in his forever home. Yay, Wally! This is Mia (original name Mixie). She was on a “rescue only” list when a friend of Eunoia Rescue asked if we could authorize to pull this baby to safety. “If you allow me to go get this fur baby, I’ll do the rest!” – and that’s exactly what happened. Mia was pulled out of the shelter with only a few hours remaining. Of course, the person in charge of the operation immediately decided to keep Mia for her very own. However, the story doesn’t stop there. Due to Mia’s troubled life, she is currently not getting along with her other fur siblings. Did her family decide to give up on her? NO! They have been slowly but surely working with her and they promise her every night that, “she’ll never have to worry about being homeless again.” THIS IS RESCUE. Bella II’s adoption has officially been finalized! She has dog AND cat siblings, two human parents, and a fenced in backyard. Her heartworm treatment is officially over and she is ready to live a happy life! Congrats, Bella! Scooter has been adopted! Do you think he’s happy about it or what?? His new name is Rory and he’s loving his new family. He even has a fenced in backyard. SCORE!! Whoop, whoop! Little Bit has officially been adopted! His parents gave him the new name of Roscoe. Along with his human parents, he also has a human roomie that he loves. He and his family go to many different places together where Roscoe ends up being the center of attention. Congratulations, Roscoe! Iggy has been adopted! She has two fur siblings and two human parents. Her forever family stepped up to the plate when we were in desperate need of fosters over the Thanksgiving holiday – and then they became foster failures! We love you, Iggy! Enjoy your new life! Pumpkin (now known as Mowgli) is in his forever home! He has been adopted by an amazing couple who took him shopping the first time they met him! He even has a fur sibling now and as you can see, it’s definitely meant to be. Woo hoo! We knew that our cutie pie Audrey would be adopted fast..and we were right! This baby is now named Precious and is completely spoiled by her new mama. Her forever mom says that Precious follows her around every where…and she absolutely loves it. Yay! Our number one foster finally became a foster failure! Hali has officially adopted Winnie and we couldn’t be happier for the both of them. This duo was definitely meant to be. WE LOVE YOU HALI AND WINNIE!! This is (the original) Bella in a big comfy chair at her FOREVER HOME!! We are so happy for this precious girl. She’s definitely one of the sweetest dogs you’ll ever meet. She now has two humans to call her very own, and they have decided to name her Penny. Third time is a charm for Snoopy! The second time Snoopy was returned to us, she was two times her ideal body weight. She has been matched with a wonderful new owner who is working hard to help Snoopy lose some pounds. We are thrilled that Snoopy has FINALLY found her happily ever after. This may just look like a nice human and a black blob…but this picture is actually of India and her FOREVER MOM. That’s right, India is officially adopted! She now lives with a wonderful couple who absolutely ADORE her. They did a great job fostering and nursing India back to health after heartworm treatment and just couldn’t let her go. We are so, so happy for all parties! Way to be a heart stealer, India! We are excited to say that our precious Fiona has officially been adopted! Fiona now lives in a full house of humans and even has a fur roomie to hangout with. Her new forever Dad keeps her busy and gives her all the attention that she deserves. Congratulations, Fiona! I am shedding lots of happy tears for our old man Tank. His (second) foster mom has decided to keep him forever and ever! Tank originally spent almost a year in a shelter before coming to Eunoia Rescue. He was with us for a good couple of months, but we knew with time that he would find the perfect place…and now he has. Oh! Tank was also known to be “aggressive” towards other animals, and now he has (and loves) his fur siblings! The progress here is tremendous! Thank you Lynzi for giving this guy the gift of a good life! Another huge thank you to Christine for being Tank’s primary foster mom. Even when Christine’s life became extremely hectic, she stayed committed to taking care of Tank until she knew he would be ok elsewhere. Like I always say, it takes a village to rescue. THANK YOU VILLAGE! Our little Sheba is forever home and as you can see, she is rather comfy there! Sheba is now known as Junebug. She lives in a lovely house with a huge fenced in back yard with her dog sibling, cat sibling, human sibling, mommy and daddy. Junebug is extremely happy. Hooray, Junebug! Whoop, whoop! Our precious little Reign (now named Riley) has found her forever home! She has a feline sibling and a human kid of her very own. She is getting lots of love and plenty of attention at her new place. Her new family is particularly excited about taking her camping on the weekends. Yay! Congratulations, little pup! Our sweet, sweet Stella has found her forever home! This baby came to us completely petrified; but thanks to a wonderful foster family and lots of love, Stella has made a complete 180. Stella has a fur sister named Dixie and they have quickly become the best of friends. She also has 2 human sisters to give her plenty of attention. We are so happy for this girl! She certainly deserves what she has now! Do y’all remember Marnie? Probably not… I let one of my bff’s (Sara) foster her and then, I don’t know what happened. Time kept going by and I would tell Sara, “we gotta find Marnie a home!” She would just give me a short response and move on to the next topic of conversation. So FINALLY Sara broke and told me that she had become a foster failure…she is giving Marnie and FOREVER HOME. I couldn’t be more thrilled! These two deserve each other. Thank you Sara for helping support my dream and for being one of the best doggy moms I know! As y’all may know, we have been searching high and low for a forever home for our Sunshine. Well about a week ago, we started getting inquiries about her. As you all would have guessed it, I was devastated. With a lot of thought and consideration, I have decided to listen to all of your suggestions…and I’m adopting Sunshine myself. She will be the mascot of Eunoia Rescue. I couldn’t imagine my life now without her. Sunshine helps me believe that with patience, determination, and love…anything can happen. It’s official! Happy Face was adopted yesterday! His forever family loves him so much already. He now has two fur siblings and a lot of humans to call his own. As you can see, Happy Face is clearly oh so happy…and so are we! Congratulations, Happy Face!! Another adoption for the books! Pablo has found a forever home! This is a picture of him and his new fur sibling. He also has a mom, a dad, and 2 human sisters. He’s extremely happy with all of the love that he receives! He even gets to sleep in the bed at night! So happy for you, Pablo! To some she was known as Jubilee, to others she was known as Jelly Bean…but now this pup is going by Sadie. Sadie is the name that her FOREVER FAMILY gave her. She was adopted over the weekend and is settling in nicely at her new place. She’s even been going to work with her new mom! Live it up in Hilton Head, sweet girl! So happy to announce that Pluto has found a forever home! His foster mom and dad turned into foster failures. Pluto is so happy to be in his forever home with his two doggy siblings. I’m also super excited because Pluto is living in my neighborhood! Yay! Also, a huge THANK YOU to these foster failures. They have done so much for Eunoia in the past few days and we greatly appreciate it! Our heartworm positive babe got adopted! Ross is now living it up in his new forever home. He was in a shelter for SEVEN months in Georgetown, SC and then came to Eunoia. He was only with us for about two weeks before being adopted by the best dad ever! Ross now enjoys playing all day and going to the park. This black pit mix has nothing but love now! Bravo, Ross! ADOPTION NUMBER TEN! Nora puts us in the double digits with our adoption count! Sweet Nora came from a kill shelter in Horry County, South Carolina. She was a product of unwise breeding. Now, she follows her new mommy everywhere and gets lots of love. She even goes on play dates with her doggy friends! Nora’s mom says that she is an absolute delight and that she enjoys taking care of such a wonderful pup. We are so happy for you, Nora! Abigail was our first feline adoption! It’s a little harder to have cats for adoption on a foster based system, so we are happy that this worked out. She originally was in a very over-crowded shelter right outside Charleston County. Abigail was adopted by her foster dad. He couldn’t imagine giving her up, so he decided to keep her himself. Abigail now sunbathes outside and cuddles in the bed. She’s living the life! Rock on, Abigail! After being in a foster home a little longer than we would have liked, Margo FINALLY got adopted! As you can tell, it was definitely worth the wait. She now has a 4 legged brother named Tobi. The two love to play all day and then cuddle. She even has a backyard with a fence. Her forever mommy loves her very much and is thrilled to have such a happy fur family. Horray for Margo! Boo-Boo is adopted! His new dad named him Max and they are the best of friends. Max has 2 fur friends in his home and they get along wonderfully. Max’s dad says that he is the sweetest most well behaved puppy ever! Max had a great first Christmas and received a lot of new gifts from his new family. It is hard to believe that Max was once sitting in a high-kill shelter, and now he is being showered with love! Have a happy life, Max! Lloyd, formerly known as Bouncer, is adopted and already loving his new life! Here he is pictured with his new friend, Sammy. His new parents felt an immediate connection with him and are so excited that they found such an awesome puppy. His work at home dad is especially excited that he has a new buddy to spend time with during the day. This was an awesome fit! Live it up, Lloyd! ADOPTION NUMBER FIVE! Riley (formerly Clover) is now happy with her new dad. She has fur siblings and lots of human love. Riley and her dad love going to the park and spending time together at various problems. The family loves her and they couldn’t be happier! We are so excited that Riley ended up in such an awesome home. Have fun living the best life ever, little pup! Oscar is certainly living the life now, isn’t he? He was once on his last days at a high-kill shelter in Columbia, South Carolina and now he is cruising with his new forever dad! Oscar loves spending time with his new Pop by picking up ladies at the patio bars, hanging out on the weekend, and of course going on the boat. We have heard that Oscar is super smart and now even knows how to “shake.” Keep it up, Oscar! We didn’t even have our precious Ginger a week until she was adopted out to her wonderful family! She was pulled from a high-kill shelter in Columbia, South Carolina and is now residing in Charleston. She’s super sweet, a little rambunctious, and completely loved by her new family! She has two teenaged sisters that give her a lot of attention. They even gave her a new name (Sadie) for her new, happy life. Best of luck to you, Sadie!